Telexplainer: Can SD-WAN Solve Your Low Bandwidth Problem? Can SD-WAN Solve Your Low Bandwidth Problem? Can SDN or SD-WAN solve your low and unreliable bandwidth problem? Hey, you can probably solve your bandwidth problems right now by upgrading to a dedicated higher bandwidth service with a service level agreement, such as Ethernet over Fiber from a top-tier carrier. A better question is how can SD-WAN give you faster and better bandwidth at a more affordable price point? Companies with bandwidth woes generally fall into one of two categories. The first is being stuck with bargain basement options because of very limited budgets. The other is being frustrated because the service needed isn’t available in that particular location at any cost. The really low cost options tend to be broadband services that were designed for the cost sensitive consumer market and then re-branded for business. These include DSL and cable broadband certainly, but may also include cellular wireless and some two-way satellite. What these services have in common is that the bandwidth pool is shared among however many users are online at the moment. That makes your speed fluctuate during the day. They also tend to be Internet only. If you want point to point you have to set up an encrypted tunnel with VPN or take your chances on security. Finally, they tend to be offered as “best effort” information services with no uptime or performance guarantees. Are All Non-Telecom Regulated Services Low Quality? No. That’s unfair and untrue. Cable speed and performance has grown by leaps and bounds, especially since the introduction of DOCSIS 3.0 and now 3.1. 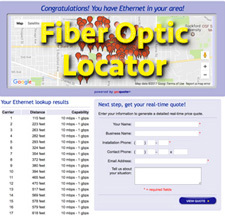 You can get fiber speeds at bargain prices in most populated areas. Reliability tends to depend on the local service provider. Some have almost perfect uptime. Others are less dependable. Likewise, cellular wireless and satellite have experienced technology upgrades over the years. Both suffered from low bandwidth, congestion and spotty service. That’s not much of a problem anymore. With 4G and now 5G wireless, fiber-like bandwidths are becoming commonplace with solid service. Satellite, too, is now 100 Mbps nationwide with gigabit service on the way. Spot beams provide highly reliable fade margins. Both cellular and satellite do have limitations, however, Satellite has a latency issue that won’t be overcome until the Low Earth Orbit constellations are in place. Both services are bandwidth limited by the amount of spectrum available, so there is only so much to go around. That means data limits to keep some users from hogging the scarce resources. If you hit the limit, you either pay more or have your bandwidth throttled for the remainder of the month. Just What Can SD-WAN Do About These Limitations? SD-WAN or Software Defined Wide Area Network, part of the Software Defined Network (SDN) technologies, can’t change the laws of physics, provider unreliability, or service availability. What it can do is manage a collection of limited performance bandwidth options to create a single higher performing network. This works because not every connection you have will have the same latency, packet loss, speed or reliability. Besides the inherent differences in technology, performance often varies moment to moment. Sometimes the cable runs blindingly fast. Sometimes it’s all clogged up. Same with wireless, satellite and even DSL. No human can sit there with a switch and direct traffic fast enough to send each packet down the best or most appropriate path by the instant. A computer can. That’s what SD-WAN is all about. A processor running software monitors multiple links. It then follows a plan for where to route traffic and it keeps track of it all. Another thing that makes SD-WAN effective is that not all traffic is equally demanding. VoIP voice calls are extremely sensitive to latency and packet loss. Data file backups aren’t. Many cloud based business applications need high performance all the time. Some aren’t all that fussy. With that in mind, a SD-WAN controller can see what demands there are for service, what paths are available and with what instantaneous performances. It can pick and choose where to route traffic for the most optimum use of the resources you have provided. Your choice of SD-WAN links might include DSL, cable, T1 lines, satellite, 4G or 5G wireless, point to point microwave, Ethernet over Copper or Ethernet over Fiber, and even SONET fiber optic lines. The right mix depends on what performance you must have, what connections are available and your budget for bandwidth. Are you struggling to do business because your current bandwidth solution just isn’t getting the job done? You should know that you have more options now than ever before, especially since SD-WAN became available. Tell a network bandwidth consultant about your particular business needs and see if you can do a lot better than what you are living with now. 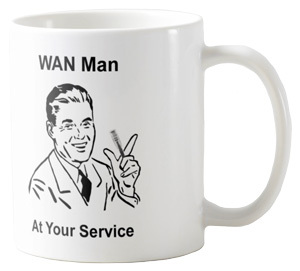 Business products with the WAN Man theme are available through our Zazzle Gigapackets store.